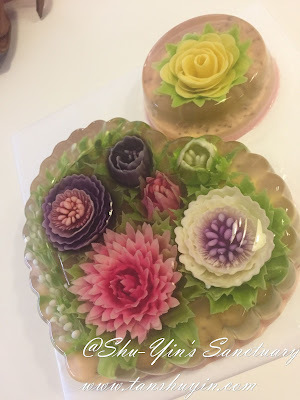 I signed up for this 3D Flower Jelly Cake class by Healthy Food Lab to learn how to make these gorgeous flowers. It was no easy feat. 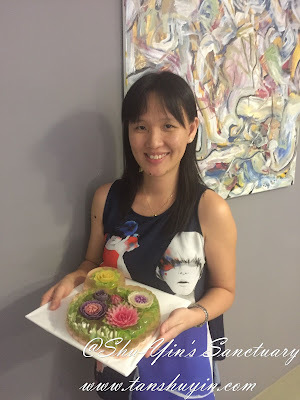 It took me 4+ hours to complete the big heart-shaped cake and the small one. It looked easy but it was not. 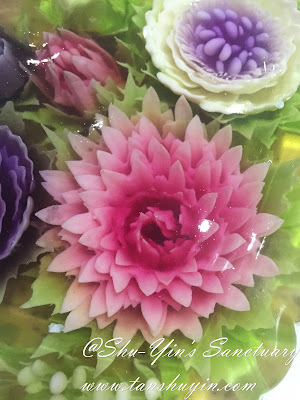 Besides learning the know-how and technique, the preparation work for the flowers were also quite tedious. We used only natural colouring for it. Like dragon fruit for red and blue pea flower for the blue, pumpkin for yellow etc. During our session, there were a teacher and 2 helpers around to teach and guide us. 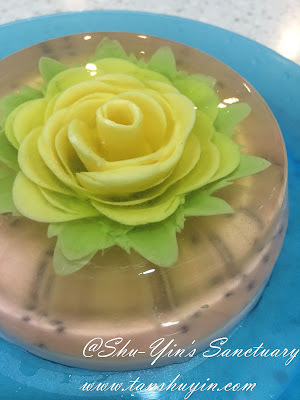 The teacher showed us which tools to use for which flower, and the technique on how to do it. She demonstrated for us once and voila, we needed to then do our own! I was really nervous at the beginning. 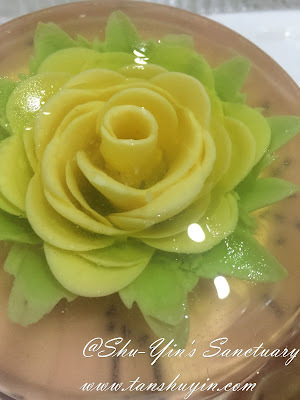 My first flower was the yellow rose on the small jelly. There was only supposed to be like 4 or 5 layers of petals but then I was nervous and didn't really know how to angled it properly to "bloom" and thus I had so many layers more. 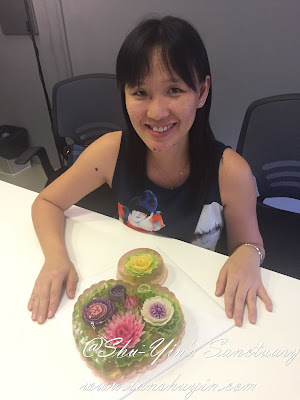 But just like what the teacher told us, "anyhow also your flowers would look pretty"! 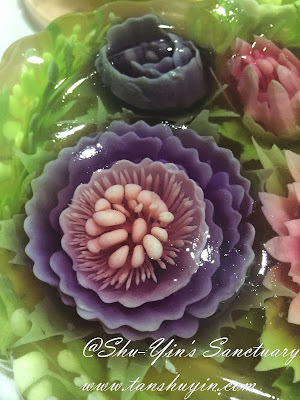 And then she proceeded to teach us other flower techniques and we did the carnation, and the purple/white flower and also the technique of the lotus flower (not in my jelly). 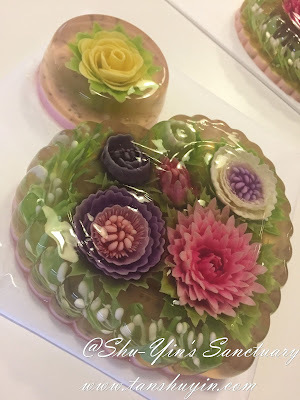 We also did flower buds, baby's breaths, on the big jelly. The teacher was awesome. I liked that she was not a fan of "gawdy" colours, just like me! haha. But she was also kind of a perfectionist, which means she made sure her work was great and she taught us how to achieve that great work too! The helpers there were great too, guiding us and helping us keeping the heat on the stove of our colour mixture. 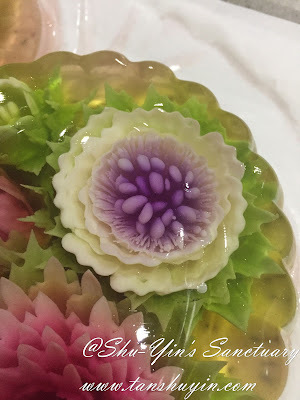 It needs heat so that the jelly component is kept liquid and not hardened. See, I told you it is a lot of work! But the end result was sooooo satifsying. We were all in awe when the teacher overtuned our jellies to reveal our masterpieces! All of us went "Awwwww......" and couldn't believe we did all that! Thanks so much to the teacher's guidance! And so this was my work. Zooming in to the individual flowers. 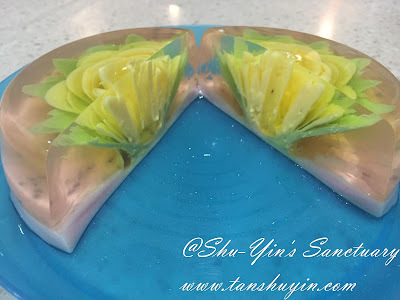 The bottom layer of the jelly is the Dragin Fruit Santan flavour so it was really delicious. This is how it looked like when cut open. The group in our session with the awesome teacher and one of the helper. 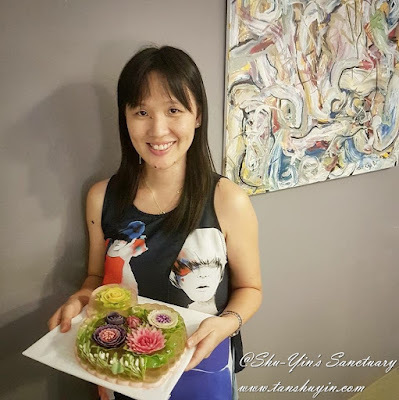 It took me about 5 hours to make the 3D Jelly Flower Cake, and about 5 mins to cut and finish the whole cake with my family! lol. "_"
Let me say this class is super worth it. 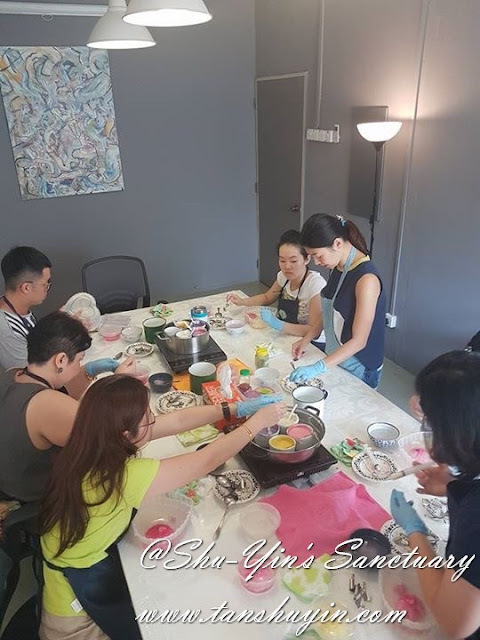 I paid RM380 for this class. It was a 5 hours class. They provided everything for you. The tools were new and for us to bring home. The provided all the fruit/food juices for the colouring. There were 1 teacher and 2 assistants. 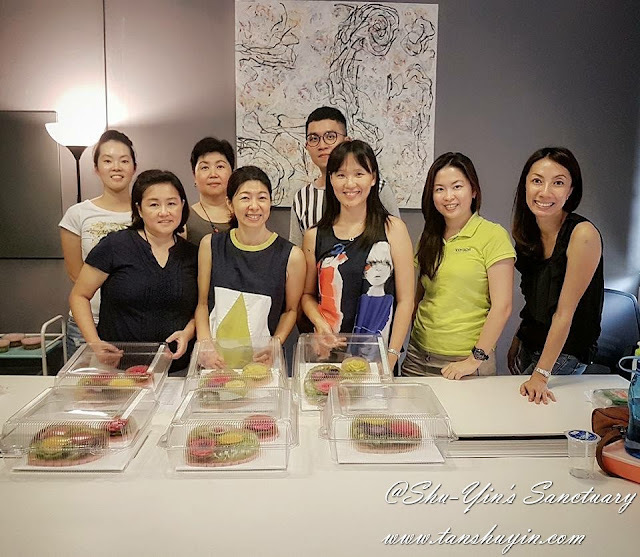 For those interested in the class, please head over to Healthy Food Lab to register for the class. ***Please take note that this post is NOT sponsored. 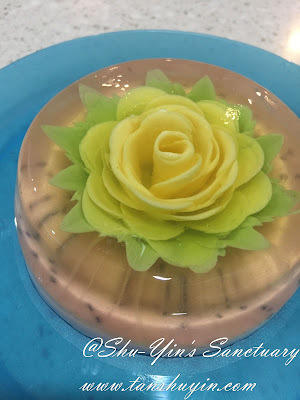 I paid for this 3D Flower Jelly Cake session with my own money. 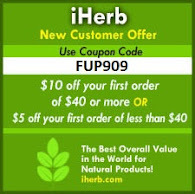 All text and opinions are of my own and represents my honest opinion of the product(s)/service(s). 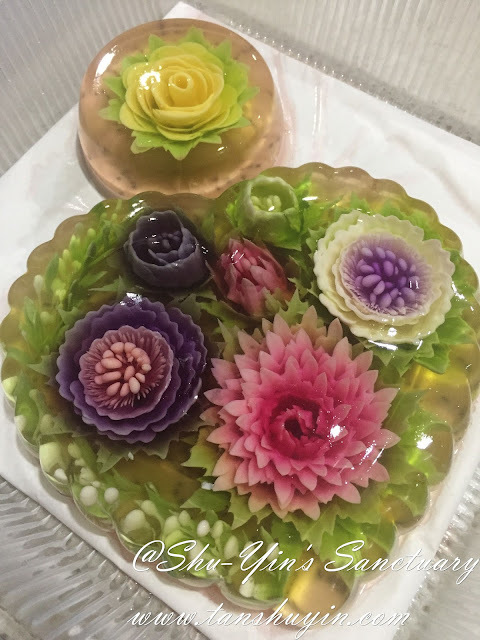 This 3D jelly flower cake is beyond amazing.You made it very well,I am still astonished that how did you make this fantastic cake.